For those of us in the Northern Hemisphere, March brings the beginning of spring, and we are so ready. On March 20, 2019, the Northern Hemisphere experienced the vernal equinox and the Southern Hemisphere, the autumnal equinox. Regardless of hemisphere and season, this March equinox is the zero point of sidereal time, a "time scale that is based on Earth's rate of rotation measured relative to the fixed stars." So what does that mean? A FRESH freaking start! What isn’t working in your business right now? Any old habits that can be released? What can we rid ourselves and our businesses of that is not propelling us to our highest and greatest success? How about on our team? Any tensions from 2018 lingering? Or are we all good and ready to BLOOM?! How about some celebrating of our 2018 wins and a great start to 2019? When was the last time you and your team got together in person to celebrate and put a face behind the Slack name? Read on and catch the buzz about remote work, leadership, news, events, and more! We are ramping up a new season of virtual trainings inside the Remote Leadership Think Tank, and we want to hear from YOU! Do you or someone you know have a great remote leadership skill to offer? A new piece of tech to improve distributed companies? A fresh perspective on a common struggle among remote teams? The retreat-style conference for remote leaders. 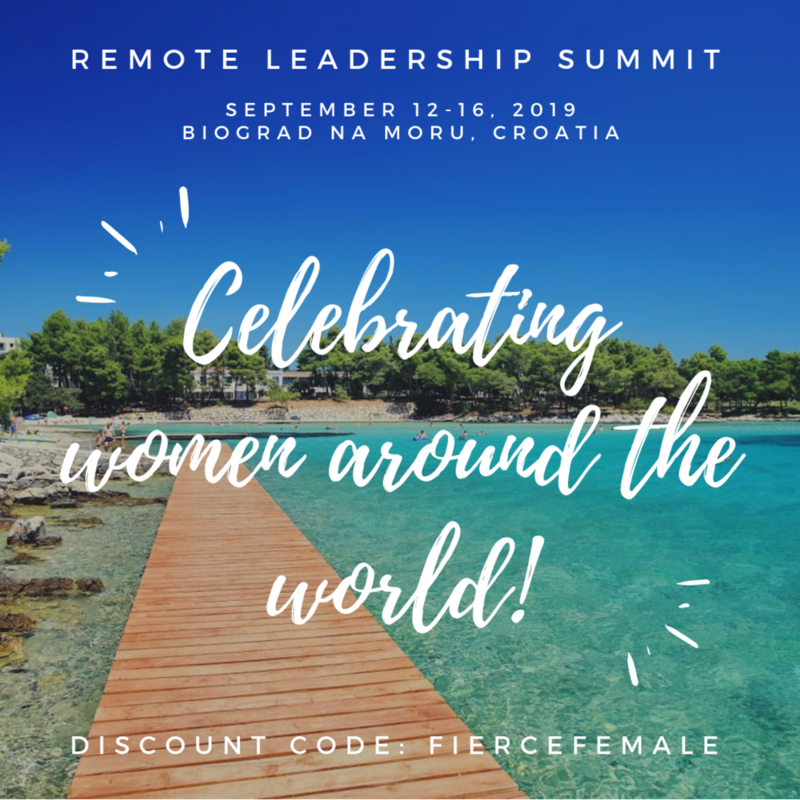 March is Women’s History Month, and in celebration of women everywhere we are offering a discount on Remote Leadership Summit 2019 tickets! Through the end of the month, get $200 off your ticket to Remote Leadership Summit. What will you do with these savings? How about gift a ticket to one of your female team members? Or reward a high performing female team member and attend together! Endless possibilities! As important as it is to keep our team members fed with new knowledge and skills, it’s just as important to make sure we are growing as distributed business leaders as well. Check out some great online and in-person resources below specifically designed to increase our skills as remote leaders. Attend Running Remote and receive a discount on your Remote Leadership Summit ticket! Discount available exclusively to Running Remote attendees. Join top remote work 💻👨leaders at Running Remote. 2 days of talks and workshops from the top echelon speakers at a magnificent beach venue in Bali June 29-30 2019. Secure your seat now 🎟️ at the limited time price: $649 ⏰ Price increases in less than a week! Discounts for teams up to 60%. Catch a video of what to expect from this incredible event HERE. Connecting the remote working world: Grow Remote, Ireland’s first remote working conference returns. Last September, a group of people in a WhatsApp Group who wanted to see if remote working could help our communities, decided to run an event. 30 communities pitched to host and Tralee nailed it, catering for 150 people from remote workers, remote working companies, and community groups. More than an event, it gave rise to fostering a community of 50+ communities across Ireland, and Europe! More information at https://growremote.ie/. 7in7 is EXCLUSIVELY for experienced nomads! Only people who have been location independent for more than a year can join the 7in7 family. Content is curated for those who’ve been nomads for 3, 7, or even 15+ years. A whole week of content is provided! From small meetups and epic parties to intensive workshops and challenging talks, the week is jam-packed with valuable events! Don’t miss your chance to join! 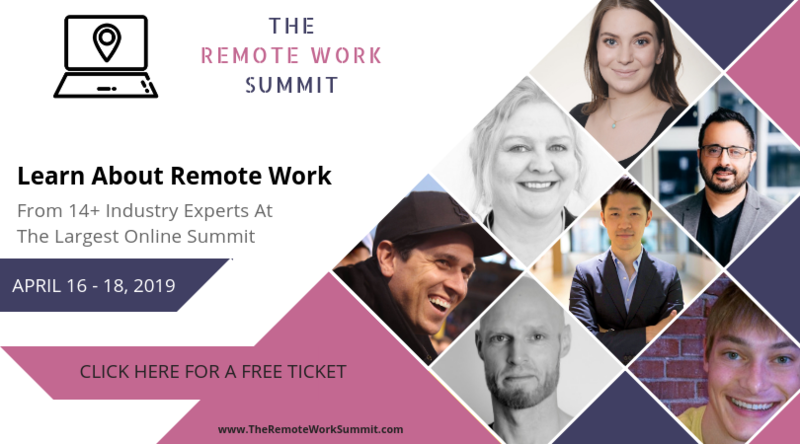 The Remote Work Summit is the largest online conference on working remotely. From April 16-18, 2019, this online event will bring together 14-20 industry leaders from multiple Fortune 500 companies, startups and agencies to talk about the challenges & frameworks to build effective remote teams, organizations & careers. More than 11,000 HRs, CXOs, remote workers & freelancers would be attending it. Get your free pass now! Where virtual business leaders unify to fuel the future of location-flexible work. Each month, the RWA hosts two private virtual events in which remote work experts gather to discuss a topic proposed by our members. Conversations are designed to be organic, interactive (including open Q&As, polls, chats, and even audience loop-ins), and impactful, based on valuable topics that can influence the market research and growth strategies of your remote-friendly brand. RWA believes that as remote work leaders, we invest significant resources to prevent the isolation of our team members, and so, it’s time for us to build the same support structure for ourselves. For more information about Remote Work association and to apply to be a member, head to https://www.remoteworkassociation.com/ today. We have some great guest blogs this month to enhance your remote work experience. Click here to read more new blogs! We have an awesome new episode from our “Why Company Retreats For Remote Teams Are All The Rage” series, hosted by our co-founder and Director of Events, Summer Weirich. In this series, we investigate the big why behind remote team retreats. There are countless teams across the globe that consider in-person retreats a vital tool in making the everyday work life harmony possible! Click on the image to hear why Olark couldn’t be the incredible remote team that they are without a company retreat! In this episode Kimberly Bringas, HR and Culture Enthusiast at Olark shares with us why Olark views company retreats as an absolute must as there is nothing that can replace seeing somebody in person. Kimberly lives in Denver, Colorado and has been working with Olark for 5 years. The Olark team operates from all across the globe! Olark is a tech company that is known for their live chat software. Olark Live Chat can help you grow your business by increasing sales, providing support, and acquiring leads! Listen to new episodes on our website HERE or listen straight from iTunes HERE! How to Foster Healthy Communication When Your Team is Distributed - Building and sustaining a healthy team culture and communication is a large part of being a successful product manager...Being co-located with your team already has several challenges, but when your team is distributed it can raise even more challenges. 10 books on how to effectively manage a remote team - There are many reasons why remote work might be the future of work. Applied correctly and by taking some tactics into account, working remotely can be a win-win for everyone. How remote work enables rapid innovation at GitLab - This article dives into the evolved views of remote work that exist and the views that are emerging. The author shares that his view has evolved over this time and shares specifically why the he believes remote is not a challenge to overcome, but actually a competitive advantage, at least for GitLab. Can Remote Work Reverse The Rural Brain Drain? - Rural Brain Drain. It’s not a term that most of us are familiar with. Yet, it’s been going on for decades, if not more. Kids grow up in small towns across America. Some go to college, some do not. But, the “big city lights” beckon them and they move away, because big cities have more to offer. They want jobs that pay more; they want things. And they leave their native rural communities in decline. Remote working is good for everyone: 3 business benefits of remote work - The number of remote workers has increased four-fold in just the past 20 years. In many organizations, the location of their employees is not a barrier to doing great work. According to a Gallup poll, the majority of Americans believe remote workers are just as productive as those who work in a business office. RLTT Stop being a remote recluse. Why remote work needs real-time communication by default - Author and RLTT Member Oleg Galkin, often sees a hyped up pitch of remote work that asynchronous communication (text chat + video calling from time to time) is enough, you just have to adapt to it. But Oleg doesn’t agree with that. Three ways women can use remote work to advance their careers - If remote work is the right fit for you, it can benefit your productivity, lifestyle, and career trajectory in ways that weren’t an option just a decade ago. Remote Reservations: Why Managers Are Afraid To Let Employees Work Virtually - Professionals around the world are wanting, seeking—even demanding remote work more than ever, but not enough virtual roles are available to meet demand—which leads to the thought: Why aren’t more companies going remote? 73% of all teams will have remote workers in the next decade - As more Gen Zers enter the job market, remote work will become the norm, according to an Upwork report...The emergence of Gen Z workers means five generations of employees are sharing the workspace. While a multigenerational workforce presents a diverse set of talent, it also presents some difficulties—mainly because of the gap in tech knowledge. With Gen Zers either being digital natives, or having technology as an integral part of their formal education, they will undoubtedly reshape the workforce. Check out these tools recommended inside the Slack community, Virtual Team Talk! We’d love to connect with you further! Our free Facebook group, the Remote Leadership Think Tank is a community forum connecting 850 + like-minded remote leaders and team members from around the globe. The purpose of the group is to create a community of fellow remote team leaders and members through discussion and support on all things remote work. Come join the conversation! Know someone who would like to join as well? Feel free to add them! Enjoy writing on the topic of remote work? Send your article submissions for the Rebel + Connect blog here! We would love to feature you as our next guest on our podcast! If you have an idea, product, or service that can benefit remote leaders and their teams, reach out and let us know! Pitch your episodes idea here. Have any questions for us or topics you want to learn about? Reach out at info@rebelandconnect.co and we will do our best to incorporate the answer into our next newsletter in addition to reaching out to you directly! Apply to work with us today! Fill out our form HERE or email info@rebelandconnect.co with subject line "Custom Retreat Request"
Rebel + Connect is a Colorado based company, owned and operated by Rachel McGehee + Summer Weirich, providing company retreat and event planning services for your remote team. All of our retreats are custom created for your team so that you get the most out of your time together! Rebel + Connect operates remotely and we service clients from all over the globe. For more about our mission follow us on Instagram and Twitter, connect with us on Facebook and LinkedIn, join our FREE Facebook community Remote Leadership Think Tank, and if you prefer you can also connect with us via e-mail be sending a message to info@rebelandconnect.co or give us a call at 970.325.6833!